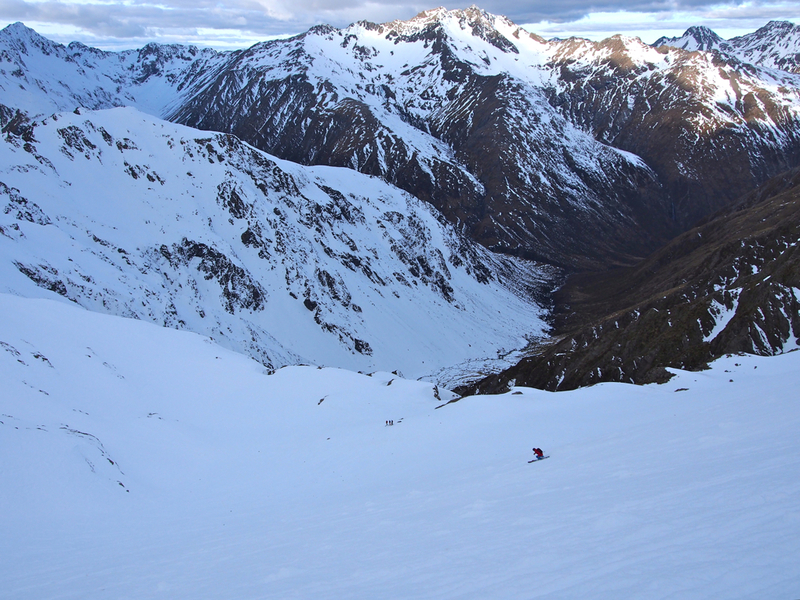 I’ve spent five days on the Armada Invictus at Taos (and one day at Temple Basin, New Zealand) in some pretty deep conditions, so this review is a good supplement to Will Brown’s review of the Invictus from the Canterbury club fields of New Zealand. Having just re-read Will’s review and given my experience the past two weeks, I can confirm that his review is spot on. He got the Invictus’ on-snow performance exactly right. So in this 2nd Look, I’ll reiterate some of his points, but what I most want to do is supplement his review by (a) talking about the Invictus’ soft snow / deep snow performance, and (b) making some comparisons to other skis in its category, including some of the skis that Will was speculating about with respect to the Invictus. That’s a good description, and the more ready and able you are to use the 188cm Invictus for “full throttle skiing,” the more you are going to like it. The 188cm Invictus feels like a pretty heavy, burly ski. If you’re not ready and able to ski it strong, you’d be better off skiing something else. Unlike the 108mm-underfoot, 185cm Blizzard Cochise, which has not fared well in the same deep snow at Taos, I’ve experienced very little tip dive on the Invictus. 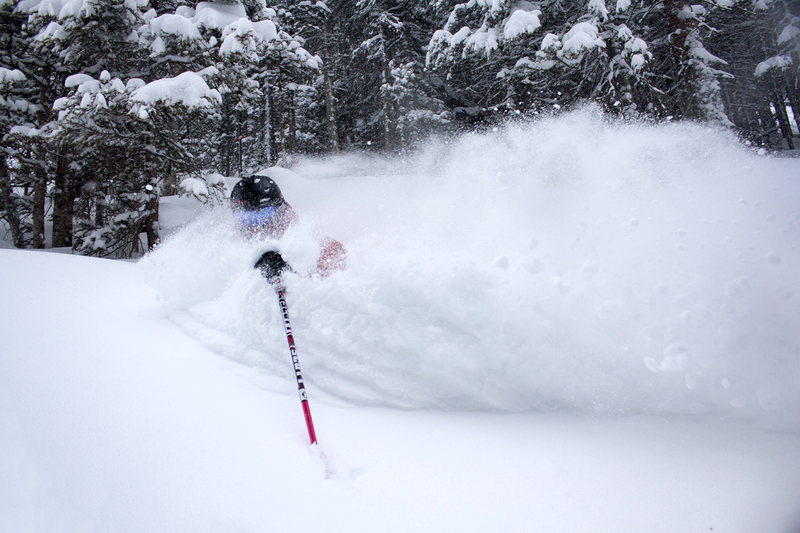 We caught the rope drop earlier this week, December 27, on Longhorn, one of Taos’ longest runs, and it was covered in knee-to-thigh deep pow. Longhorn is an open run, and very conducive to fall-line skiing at pretty high speeds. The Invictus performed well here in what is, essentially, its wheel house: soft—and even deep—conditions. The Invictus is not an especially quick ski, and its tails are not very tolerant of backseat skiing. So if you’re going to be skiing a lot of bumps, you’ll want to be a strong skier with good technique or you will get punished. (The same is true of the 190cm Salomon Q Lab.) In fact, I’ve moved the mount point up .5 cms in front of the line to make these feel a bit quicker in big, steep bumps at speed. The Invictus already has a good bit of tail, so I haven’t been tempted to move any farther forward, and have been happy with the ski at +0.5. In moguls, the Line Supernatural 108 is a much easier option, though the Supernatural 108 is a far more playful ski, while the 188cm Invictus isn’t going for playful. To be clear, if you’re skiing lower-angle bumps with good lines, you ought to be just fine on the Invictus. But this ski isn’t going to help you ski bumps better. I had a good time skiing the Invictus on Taos’s frontside (Spencer’s, Rhoda’s, etc.) though I was never able to ski relaxed or lazy on these things. What the Invictus does do is track exceptionally well in soft chop and deep snow. On a run down the backside of Temple Basin, New Zealand, the stability of the Invictus was impressive, and I never felt out of control when letting these skis run flat out. Jonathan Ellsworth on the Armada Invictus, Temple Basin, New Zealand. I don’t think the Supernatural 108 would have felt as inherently stable, and the 185cm Cochise may have struggled when hitting deeper pockets of snow. I tend to think that the 190cm Salomon Q Lab would have felt most similar / most at home here, despite the fact that it has a tighter sidecut radius than the Invictus. But what I know for sure is that the Invictus is an extremely fun and capable ski to rip huge turns down Taos’s Kachina Peak. Who’s the Invictus 108Ti For? If you’re worried that the 188cm Invictus might be too much ski for you, then chances are it probably will be, and skis closer to the Playful / Forgiving end of the spectrum will likely be the better fit. If I had to predict who would be happiest on the 188cm Invictus, it would be the person who thinks that the 185cm Cochise might be too little ski, while the 193cm Cochise might be too much. Or the person that is willing to work a bit more than he or she would on the 185cm Cochise for the sake of getting a significant deep-snow performance upgrade over the 185cm Cochise. The Invictus is an exciting development from Armada, and it’s cool to see the company move into this category of the legit, directional charger. It’s also cool – and pretty unique – to see a ski this stable also perform so well in soft and deep conditions. So much so that, while this is a very good mixed conditions ski, I’d say that it skews toward the soft / deep end of the snow spectrum rather than the firm end of the spectrum. To get our comparisons of the Invictus 108Ti to nine other directional chargers, and see all of them on a spectrum from ‘most demanding / stable’ to ‘most playful / forgiving,’ see the Blister Deep Dive: Armada Invictus 108Ti. For a charging fall-line skier that skis pretty much only resort conditions at a busier resort, this sounds like a great ski to pair with the Salomon X-Drive 8.8, as part of a two ski quiver. How’s the float compare to the 191 Katana (pretty familiar with that ski)? Not necessarily concerned with surfiness – I have otherskis for that. Yep, I could easily see the 8.8 and the Invictus for the scenario you describe. As for float vs. the 191 Katana, it’s been too long to say for sure. But the good news is that we picked up a new pair of 191 metal Katanas to have in the reference fleet – so I’ll drill them and hopefully can comment on this comparison soon. Sweet! I love my 191 Katanas for alpine-oriented resorts like Mammoth. Was really sad to see them discontinued. At least there’re lots still floating around on the used market. Oh, also curious about a Wrenegade comparison. But you guys never skied the 191 and haven’t been on the 186 yet. Sigh. I know. Really, really want to ski the 186. Given how well the previous 181cm Wren skied pow, I suspect that the new Wren will be at least a little more pow-specific than the Invictus, since the Wren is wider over all, with wider shovels and more tip and tail rocker. Any thoughts on where the 2015 Mantra fits in with some of the skis mentioned in this review? I know it’s narrower by 5/16″ underfoot (underboot?) I ski on 13/14 Mantras and am eye-drooling the new ones for no good reason. I really like the idea of showing skis in a continuum from stable / demanding to playfull / forgiving. Expanding on the idea I feel like there are generally two distinct continui in the ski Industry. Chargers on the one side, playfull forgiving skis on the other side. But it doesn´t seem like one continuum starting with the devastator ending with the Automatic / Soul 7. There seems to be a huge gap in the middle. Which is exactly where I would be looking for my perfect ski. Am I wrong? Are there skis exactly in the middle that I am not aware of? Your inital review of the SN 108 sounded to fall in this category. But then Line reduced the splay and thus moved the ski more in the charger direction. Your review sounds as if you prefered the prototype version aswell. Is it really impossible to pair a fairly stout ski with a good amount of splay in tip and tail and a reasonable amount of taper to generate the one ski to rule them all? I do think there are a lot of skiers like me for whom skis like the Invictus are to demanding while the Soul 7 just isn´t stable enough. Hey, Matt – to be clear, my worry was that I was going to find the production 108 to be LESS of a charger than the prototype, given the reduction in weight. And that the production would feel less stable and smooth on groomers. But the production is fantastic on groomers, very good in pow given its width and length, and very quick and playful. If anything, I think the production version is quicker / slightly less stable / more playful than the heavier prototypes. I also think it’s important to appreciate that skiers of different sizes and abilities who are skiing different terrain and tricking (or not tricking) are going to have different responses to what feels like “an exactly in the middle,” 50/50 ratio of playfulness & stability. 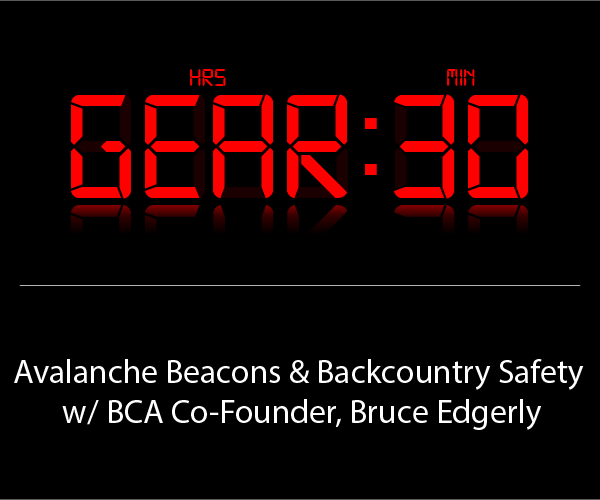 Some skis it seems you should consider: the Moment PB&J, the Blizzard Peacemaker, the Whitedot Director. Very useful way of comparing these skis. I would be curious to know where the howitzer and the zealot would fall? the 108ti 2014/2015 would be my new freetourer in conjunction with the vipe black 12 binding. My Skiing position is a mix from new school to a littel bit backseaded. Is Revomend Factory right, or better -1?